In the Math Architect Game, players take the role of an architect - the goal is to design a plan for an apartment, like the one shown at the right. On another page, I have an online version of math architect. This page explains how to play the game offline. All you need is a piece of paper and a pencil for each player, and a way to generate random numbers from 100 to 1000. Generating random numbers might be tricky. Here's some ideas. If you get hold of some 10 sided dice , you can roll three at a time. As long as you agree which one represents the 100's, 10's and 1's digits respectively, you have an instant random number from 0 to 999. If the number is less than 100, then re-roll. You could make a spinner out of cardboard, with 10 segments labeled 0 to 9. You could work through the digits of pi. The decimal digits of this important number don't show any pattern, no matter how many you work though. For most practical purposes, they are random strings of digits. You can get 100,000 digits of pi from this page. Choose a row at random, and start working across the row, pulling off the digits in groups of three to get your numbers from 0 to 999. Worst come to worst, you can get a digit from 0 to 9 by rolling two normal 6-sided dice, subtracting 2, and re-rolling if you got two sixes. This gives digits like 5 or 6 a much better chance of coming up than 1 or 2 or 9, but that should be fine for this game. Anyway, once you've chosen a random number from 100 to 1000, that's the area of the apartment players must design. Each room of the apartment must be square, and the total area must be the selected number. The players can either do the design on graph paper, or by writing out the sizes of the rooms in the apartment. 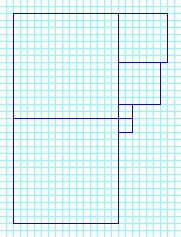 The player who designs an apartment with the correct area, with all rooms square, using the smallest number of rooms, wins a point. If two or more players each have the same number of rooms, they each get one point. Then, a new random number is chosen for the next design project. It might be wise to use a calculator to check that the area of each apartment design, to make sure it's correct! This game could be played with a teacher of parent leading the game as the referee and arbiter of disputes, or alternatively everyone present could be playing, with players taking tuns to roll the dice or spin the spinners. If the rules are not clear from this description, hop over to the online game and play for a while until the rules make sense!